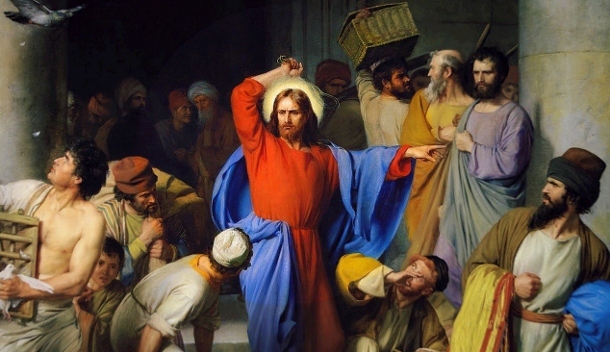 In today’s climate of heightened political rancor, some believers use the cleansing of the temple gospel narrative as a proof text to justify all manner of egregious and violent behavior toward others — “After all, Jesus whipped people.”—sic. The cleansing of the temple account is one of the favorite proof texts of those who want to try to deflect the potency of Christ’s clear ethical commands to overcome evil with good and to love one’s enemies. The NEB version translates Psalm 69:9 as: The zeal for your house shall destroy me. According to the Synoptic Gospels, within one week of the cleansing of the temple, Jesus is dead. The Synoptic gospels make it clear that this event sealed his fate. His first (and last!) public sermon in the synagogue (Luke 4) and the cleansing of the temple stirred visceral human hatred unto murder. Why? What was it about both events that stirred such deep hatred among “normally decent" people? What was going on? How should we understand the cleansing of the temple narrative in the light of illegitimate attempts by so many to justify their violence and hatred by claiming Jesus as their model?